Protect as you power up. 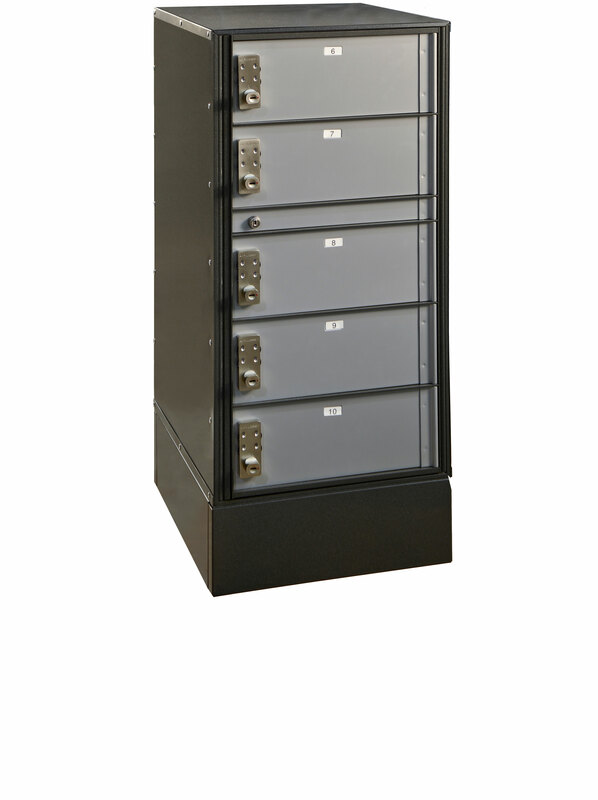 Our Laptop Lockers keep mobile devices secure and offer dedicated recharging outlets for every unit. Choose either a 5- or 10-drawer locker and save space with our stackable design. 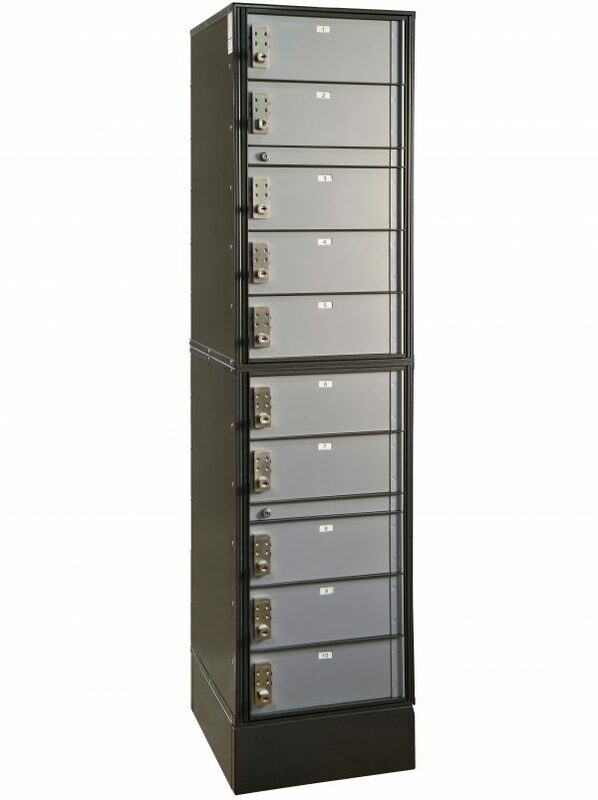 Lockers easily accessed via our innovative keyless or 16 million security key lock system. Mount to wall (flush or recessed) or select an optional 6” base. Patron Locks & Keys (Opens to the Right)(Lock Only) 5 Pk. Patron Locks & Keys w/ all Hardware Included - 5 Pk. Parcel Locks & Keys (Opens to the Left) - 5 Pk. Keyblank (Codes: 4000-4999PS) 100 Pkg. Keyblank (Codes: 3000-3999PS) 100 Pkg. Utility Lock Cam - 5 pk. Masterlock- Keyed Alike - 5 Pk. S-ecurity: Individually locked and roomy compartments protect range of assets. M-anagement: Master frame provides administrative access to all locked compartments. A-ccess Control: Choice of innovative keyless or 16 million security key system. 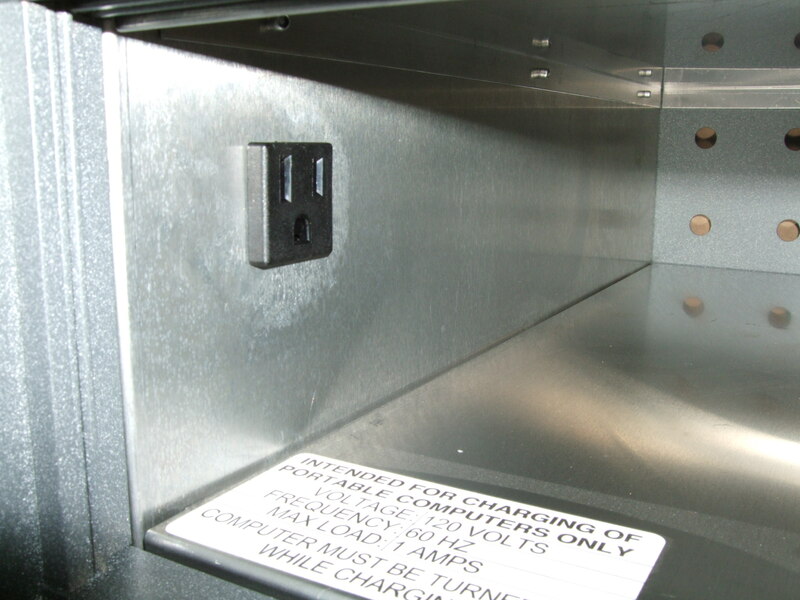 R-echarging: Convenient charging via 110V outlet in each locked compartment. T-oday & Tomorrow: Fixed or mobile solution with casters. Mix-n-match sizes/models. Black filled 3/4″ (19mm) permanent engraving. Proprietary key locks with 16 million combinations. All aluminum extrusion and sheet metal. Extruded frame allows access to all compartments. 5052-H-32 extruded aluminum 1/8” thickness; doors swing on continuous hinge. 4 Dial keyless locks with master key override. Recharging via 110V outlet in each compartment. Units are stackable (2 max.). Secured to wall or recessed. 33” H x 17 1/8” W x 18” D.
3-7/8” H x 14-1/4” W x 17-1/2” D.
7 Door 3-7/8" 14" 17"
5 Door 5-3/8" 14" 17"
Single Stack 33" 17-1/8" 18"
Single Stack with Base 39" 17-1/8" 18"
Double Stack 66" 17-1/8" 18"
Double Stack with Base 72" 17-1/8" 18"